The Holidays is a time for busting out some homemade recipes. 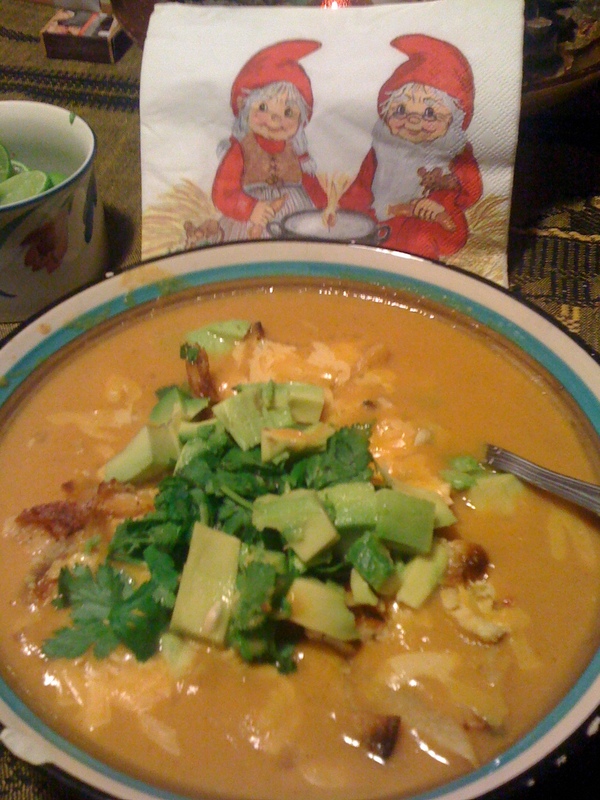 My friend Tannia invited me over for dinner…specifically for some yummy tortilla soup! She got this delicious recipe from her dad, Juan Olivera of Ventura County in Southern California. It took Tannia a few hours to prepare this dish which included cooking lots of fresh vegetables & using a blender to name some of the steps. It was definitely a labor of love! Thank you Tannia for a lovely dinner! And thanks to Mr. Olvera for starting a great family tradition! Scroll down for the ingredients! Add salt and paprika to tortilla soup in a pot until all ingredients are cooked. After simmering in pot, put soup in a blender & serve in your favorite dish bowl! Finally, add toppings to the soup! Hello, Alexis! I finally received the exact ingredients and recipe, so I have updated the blog post! Check it out! Happy New Year!